In a NYTimes op-ed, Paul Krugman attacks Republicans (like Rick Perry and Mitt Romney) for being anti-science and anti-intellectual. But the science and critical-thinking errors in his post demonstrate that it is in fact Krugman who is anti-science and anti-intellectual. The most common sign of the anti-intellectual is the ad hominem attack, where you debate an opponent’s character rather than his/her arguments. That’s what Krugman does here. In an op-ed that is supposed to be pro-science, nowhere does Krugman discuss scientific evidence. Instead, he only discusses character, implying that you should not believe what Republicans say about Evolution and Global Warming because they are anti-science. Reasonable people disagree with each other. There are two sides to every debate. The anti-intellectual forgets this, and comes to believe that there is only one side to the debate, their own. The anti-intellectual comes to believe that the reason the other side disagrees is because they are not reasonable people, that they are evil, stupid, and corrupt. "Just a theory" with "some gaps in it"
Krugman criticizes Perry’s claim that Evolution is "just a theory" that has "got some gaps in it". Perry is correct. Evolution does have some gaps in it. It doesn’t have have as many gaps as Perry wants (there are no important gaps in the evidence of Man descending from the Ape). Nor are there any gaps that would disprove the theory. But there are gaps nonetheless. The most important gap is how life began. Unlike the clear radiometric dated fossil record of the descent of Man, there is no evidence how life began. There are many promising hypotheses and tantalizing bits of data, such as the creation of amino acids without life or self-reproduction of RNA, but there is little that they can "prove". The issue is that Democrats and educators teach students that while science doesn’t know precisely how life began, that students should have faith that science will eventually discover a natural cause. The Religious Right is understandably upset at this: instead of competing against science, they are competing against a state-sponsored faith. In the 2008 presidential debate, (left-wing) moderator Chris Mathews asked the candidates to raise their hands "do you believe in Evolution?". That’s a faith-based question about beliefs. Scientific questions would be of the form "are you convinced by the evidence that life-forms have changed on this planet for billions of years?" or "are convinced by the evidence that Man descended from the Ape?" or "are you convinced by the evidence that life began through a natural process?". It’s not the "gaps" that was anti-science in Rick Perry’s comment, but his proscription that schools should teach Creationism/Intelligent-Design alongside Evolution and let students decide for themselves. That’s wrong. Creationism/Intelligent-Design are non-falsiable hypotheses, and have no place in the classroom. What students should be taught instead is simply that nobody knows how life began. More importantly, students need to be taught the lesson that science is as much about what we don’t know as it is about what we do know, that we don’t use faith to fill in the gaps. The more scientists admit what they don’t know, they better the public can trust them about what they do know. Science is about the best theory that describes the available evidence. An easy way to spot anti-science is when somebody cites a trend, such as "the evidence increasingly shows that ..." or "more and more scientists believe that ...". Rick Perry made that mistake, saying that scientists are increasingly doubting Global Warming. That’s anti-science. But then Krugman turns around and makes the same mistake, saying that scientists are increasingly believing that Global Warming was worse than previously thought. That’s equally anti-science. The only scientific arguments are about what the evidence shows now, not what it will show in the future. Krugman discusses Rick Perry’s "truly crazy conspiracy theory" that climatologists are exploiting Global Warming for their own gain, that they know the truth, but since they are earning so much money from Global Warming, they refuse to admit the truth. Krugman is right, this is a conspiracy theory. But at the same time, Krugman believes in conspiracy theories going the other way. For example, Krugman believes that Global Warming denialism is a conspiracy funded by the oil companies. Although both these conspiracy theories are false, it is still fair to say that both sides are biased. Bias doesn’t imply conscious decisions to falsify data, but the unconscious process that tilts data in one direction. Bias happens in every discipline, not just climatology. Take, for example, the question whether mobile phones cause brain cancer. The WHO recently added mobile phones to its list of thing that "possibly" cause cancer. It did so despite any evidence. That’s because you can’t prove a negative; you can’t prove that mobile phones don’t cause cancer. Many studies are performed, but most fail to show a link, so they don’t get published. By pure chance, some will show lower cancer rates among mobile phone users. The are obviously wrong, so won't get published, or will be endlessly investigated to find out what's wrong with them. By pure chance, a few studies will show higher higher rates of cancer. They get published, and get press attention. Hence, the literature will always show higher cancer rates among mobile phone users, even if there is no correlation. The same is true of climatologists. There is no reason to believe that they are less biased than their peers in other scientific disciplines. Yet, any charges of bias are attacked (by among others, Paul Krugman) as being unfounded conspiracy theories. Krugman makes the claim that you should believe in Global Warming because it’s the consensus of 97% of climatologists. That is a critical-thinking fallacy known as "Appeal to Authority". You can read up on it at Wikipedia. This fallacy fails with Global Warming for three reasons. The first is the precise definition of "Global Warming". Even skeptics, the so-called denialists, agree with the basic scientific evidence that the globe is warming, that carbon dioxide is a major greenhouse gas, and that mankind has raised the level of carbon dioxide in the atmosphere. Agreement with this scientific evidence of "global warming" doesn’t imply agreement with the political theory of "Global Warming" that catastrophe is coming unless mankind divorces itself from fossil fuels. The second "Appeal to Authority" problem is that it’s like saying you should believe in Astrology, because it’s the consensus of Astrologers. Climatology is different from other sciences, for the most part, because it’s trying to make predictions about what will happen 50 years from now; we can’t completely prove the theory until "it’s too late". This leads to a reliance on computer models, questionable statistics, and irreproducible results that would be unacceptable in other scientific disciplines. If you read the UN IPCC consensus reports, you'll find good reasons to question how the science was conducted. The third "Appeal to Authority" problem is the bias problem discussed above: Global Warming is not the conclusion of the discipline so much as the premise. It’s like how evolutionary microbiologists lack proof of how life began, but are actively looking for that proof. This means that 98% of evolutionary microbiologists believe life began through a natural process, although they haven’t found proof of it yet. Likewise, globalwarmology started with a vague hypothesis, then governments started spending billions looking for proof of that hypothesis, creating the field of climate science that we know today. 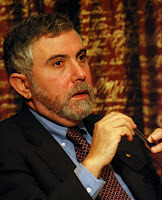 Krugman calls candidate Mitt Romney a moral coward for saying "I don’t know if it [Global Warming] is mostly caused by humans". But saying "I don’t know" is the hallmark of the scientist. What makes science better than religion is the willingness of scientists to admit they doesn’t know, rather than bridge gaps in knowledge with faith. Romney failing is his faith that God created life rather than admitting "I don’t know" to that question, too. The moral coward here is Krugman for insisting that Global Warming is some sort of moral debate rather than a scientific debate. It’s a common tactic of the Democrats: it’s easier to win this moral debate rather than a scientific one. But Global Warming is firstly and lastly a scientific debate -- if you can’t cite the scientific evidence, then you shouldn’t be debating the issue. Yes, Republican politicians are frequently anti-science, but that’s because they are politicians rather than Republicans. Democrat politicians are equally bad. There are few politicians, on either side, as anti-scientific as Al Gore, who mangles the science of Global Warming, declares it to be a moral debate rather than a scientific one, and says that you shouldn’t believe the scientists anyway, because they underestimate the problem. Pundits, like Krugman, are supposed to be the counterweight, to hold up intellectual/scientific principles in the face of politics. Yet in this post, and many others, Krugman demonstrates he is just as bad as a politicians. A good counter-example to Krugman is the Republican economist N. Gregory Mankiw (chief economist under Bush, advisor to Mitt Romney). Like Krugman, Mankiw has a popular economics blog. Like Krugman, Mankiw has written a popular college textbook on economics. Whereas their textbooks are in agreement on the basics of economics, their blogs are in disagreement on applying economics to political issues, like the current economic problems. Whereas ad hominem attacks are common in Krugman’s blogs, they aren’t to be found in Mankiw’s blogposts. Indeed, Mankiw often gives glowing praise to those he disagrees with. In addition, Mankiw frequently describes a debate from both sides, describing why reasonable people might disagree with him. Krugman has a lot to learn about intellectualism from Mankiw’s blog. Update: Here is another example. This Krugman post starts off with a personal attack, the Mankiw counterpoint does not.